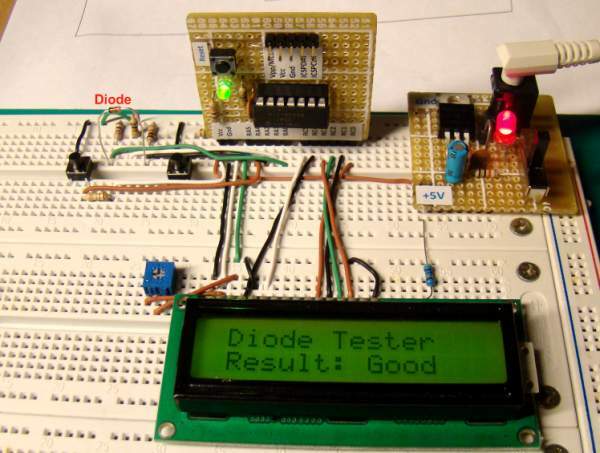 Most of the digital multimeters these days have built-in features for testing diodes and sometimes transistors. 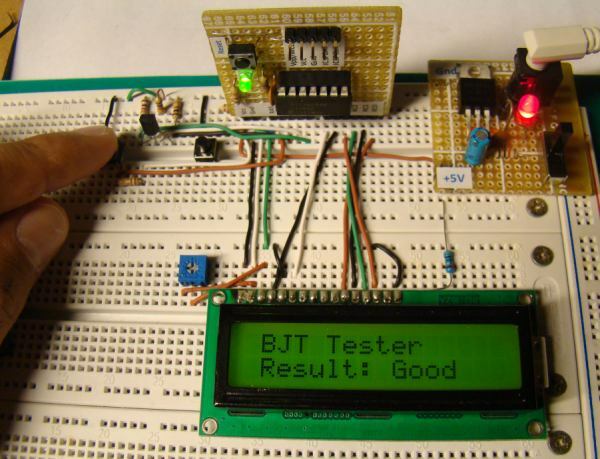 The purpose of this project is to demonstrate a simple way to construct a testing device for diodes and bipolar junction transitors (BJTs) using a microcontroller. The testing algorithm is based on a simple fact that a working PN junction conducts current in only one direction. 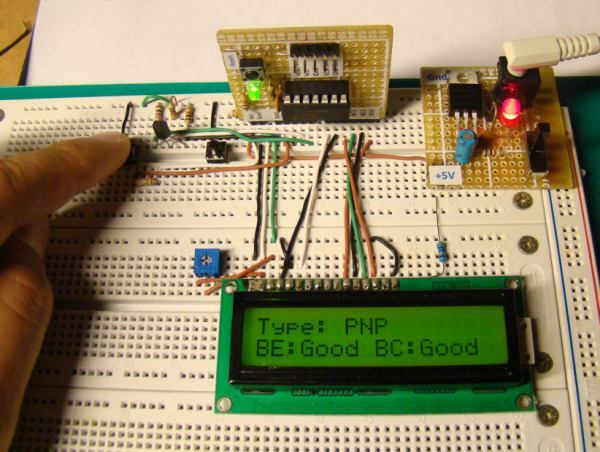 A PIC16F688 microcontroller is used in this project that switches the bias voltage across the PN junctions of diode and transistors, and determines if a particular junction is normal, open or short. 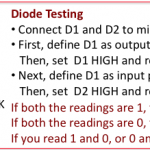 The logic behind testing a diode is straightforward. A diode is a PN junction that allows the conduction of current only in one direction. 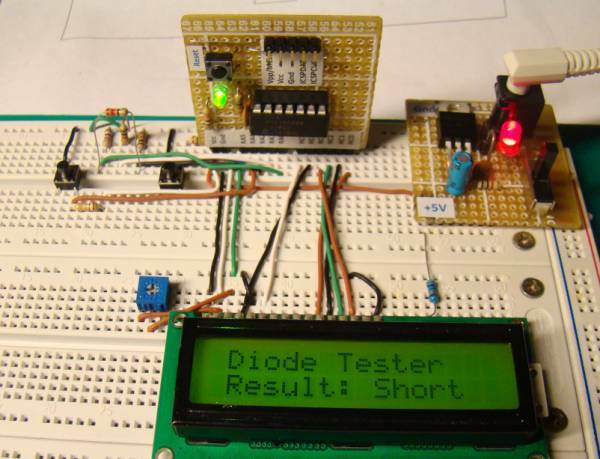 Therefore, a good diode will conduct current in only one direction. 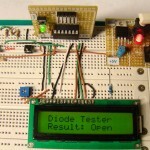 If it does in both the directions, it means the diode is short, and if it does in neither direction, it is open. The circuit implementation of this logic is shown below. This concept can be easily extended to test a transistor by realizing that a transistor consists of two PN junctions: one betwen the base and the emitter (BE junction), and the another between the base and the collector (BC junction). 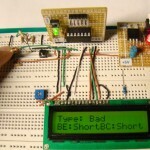 If both the junctions conduct in only one direction, the transistor is normal, otherwise it is faulty. 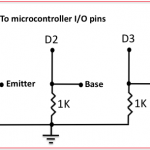 We can also identify the type (PNP or NPN) of the transistor by considering the direction of the current conduction. 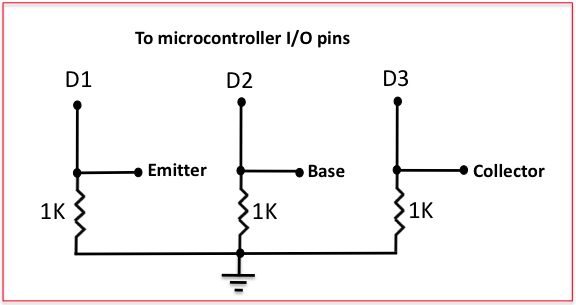 Three I/O pins of a microcontroller are required to implement the testing algorithm for a transistor. The test sequence for a transistor would go like this. Set D2 High and read D1 and D3. If D1 is High, BE junction conducts, otherwise not. If D3 is High, BC junction conducts, otherwise not. Set D1 High and read D2. If D2 is High, EB junction conducts, otherwise not. Set D3 High and read D2. If D2 is High, CB junction conducts, otherwise not. 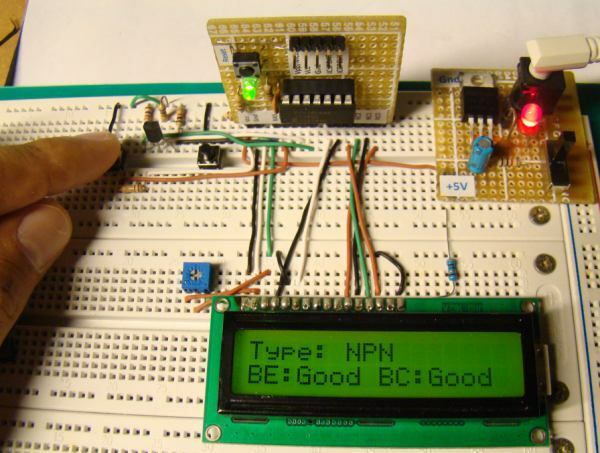 Now, if only the BE and BC junctions conduct, the transistor is of NPN type and is working fine. And, if only the EB and CB junctions conduct, the transistor is still normal but the transistor type is PNP. All other cases (like EB and BE both conduct, or BC and CB both not conducting, etc.) 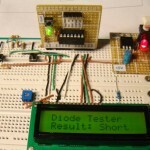 indicate the transistor is not good. The circuit diagram for this project is pretty simple. It has two push button switches for inputs, named Select and Detail. 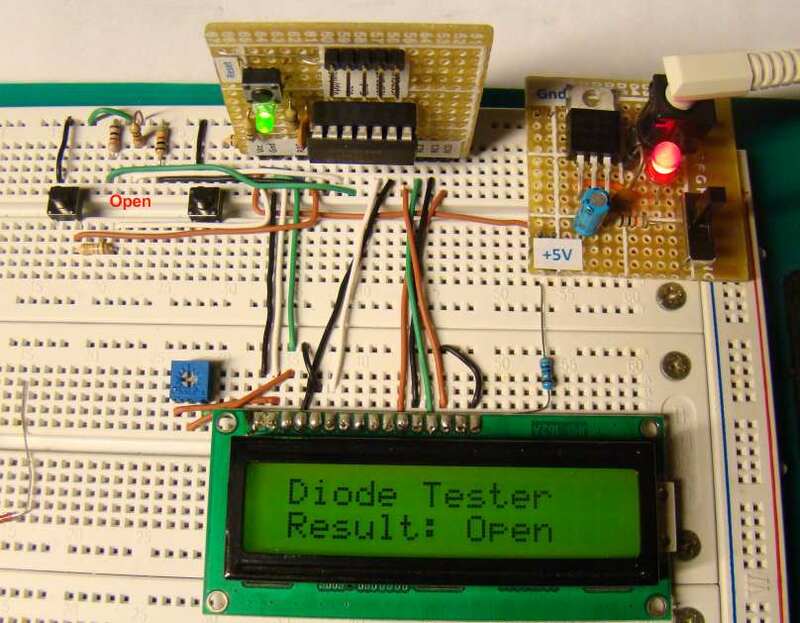 Pressing the Select button allows to choose between the diode and transistor testings, and the Detail button is active only in case of transistor testing and displays the details of the test results like the transistor type and both the junction status. The three legs of a test transistor (E, B, and C) are grounded through 1 K resistors, and the two PN junctions will be tested through RA0, RA1, and RA2 port pins of a PIC16F688 microcontroller. The testing of a diode requires only two pins, and will use the E and C pins. That’s why they have alternate labels, D1 and D2, in the circuit diagram. 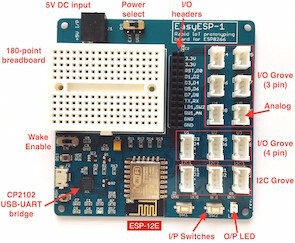 The firmware for this project is developed with MikroC compiler. 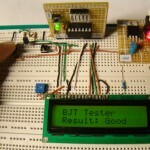 While programming, you must be very careful about the direction settings of the three test pins (RA0, RA1, and RA2) because they change frequently while running the testing algorithm. Before setting any test pin to High, you must make sure that the other two pins are defined as input pins so that there won’t be any voltage conflict or short circuit between the port pins. 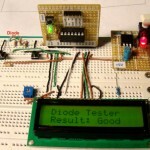 Here are some of the pictures I took of my diode and BJT tester while testing various input conditions. hi friend ,plz send code,given code are not run. plz send code,given code are not run. i want to ask if we want to test the transistor do we need to recognise the pin leg first or just put it then the system can tell which one is collector,base or emitter ? j’ai trouvé votre projet tres intéréssant et atractif . il a fonctionné du premier coup. 1)) l’ afficheur LCD indique le résulta à une fréquence ” RAPIDE ” . trés difficile de lire le résulta . 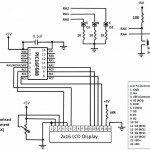 2)) J ‘ai vérifié les FUSIBLES des BIT comme indiqué =osc :int rc-clkout. VOILA ce que j’ai configuré pour les FUSIBLES . hello..do you have any idea circuit for smart solar phone charger? Why is this problem ? function maia not found ??? The function name is main(), not maia. there are to lines ( legs ) connected to pin 4 for reset and detail switch right ? Those two lines go to pins RA4 and RA5 of PIC16F688, which is clearly shown on the circuit diagram. The MCLR pin number 5 is connected to a reset switch. PIC16F688 is a 14-pin whereas PIC16F877A is a 40-pin device. 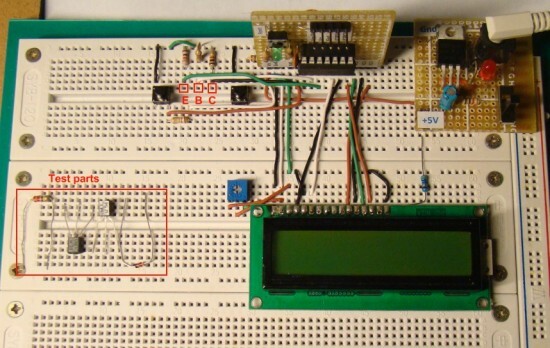 You can use any other microcontroller for this project, but you need to modify the code accordingly. 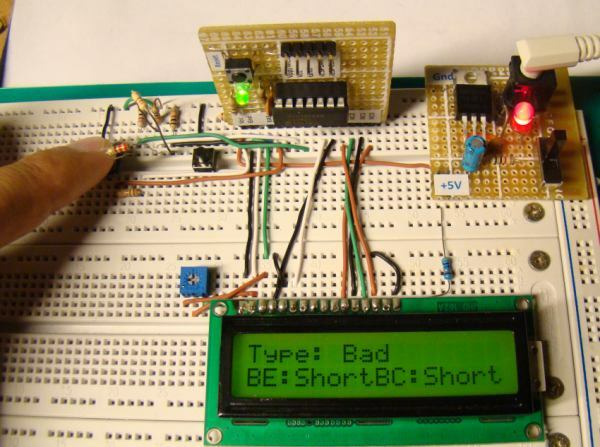 Hello Mr. RB, told him that I have not been able to compile the code in the MikroC DiodeTester, I’ve checked everything with the help of this compiler MikroC and still shows me the message (‘,’Expect But LCD_RS found) on line 8 , I mean the line where this (SBIT LCD_RS at RC4_bit;) and another message that says (Internal error), if you will kindly publish the entire project would greatly appreciate it, without more, you apologize for the inconvenience, thank you. Ok, RB going to study more with the help of MikroC, although the process of creating a project in mikroPascal MikroC is identical to and I see no difference, I’ll be more careful in repect, I owe much for your help, I am very interested in these types of projects, especially those of the instrumentation to the electronics such as development of an ESR tester, Semiconductor, and a few others, prefer to develop in mikroPascal, so I fully understand the code in mikroPascal MikroC to translate it, my interest is very particular because it means a great saving yourself money frabric their measurement instruments, good response and I owe the time to answer my questions, oh and you excuse my poor English, my language is Spanish. Thank you for your attention, I await your response. I didn’t get how did you get these lines. The source code has something like this. Besides, did you read MikroC user’s manual to learn how to create a new project in MikroC? I would suggest to read this first : Flashing LED. Once you created the project, then copy the content of source code and paste it on the program editor. Delete the main() function that is automatically included in the editor window when a new project is created. R-B thank you very much my friend, I’ll review the source code to see if I can compile with MikroC, after this, I will add code to test mosfet transistor, thanks again, I am aware and working on this. 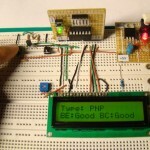 Very interesting your project, I really liked the use of the LCD, if you could send me the source code to my mail would really appreciate it, I’m trying to implement some code for trasistores MOSFET, if you have any ideas or suggestions you even better, do not forget to send me the code, which is published here with errors and I can not compile in MikroC, thanks for your help, I hope your answer. The downloadable zipped file now contains the source code too. 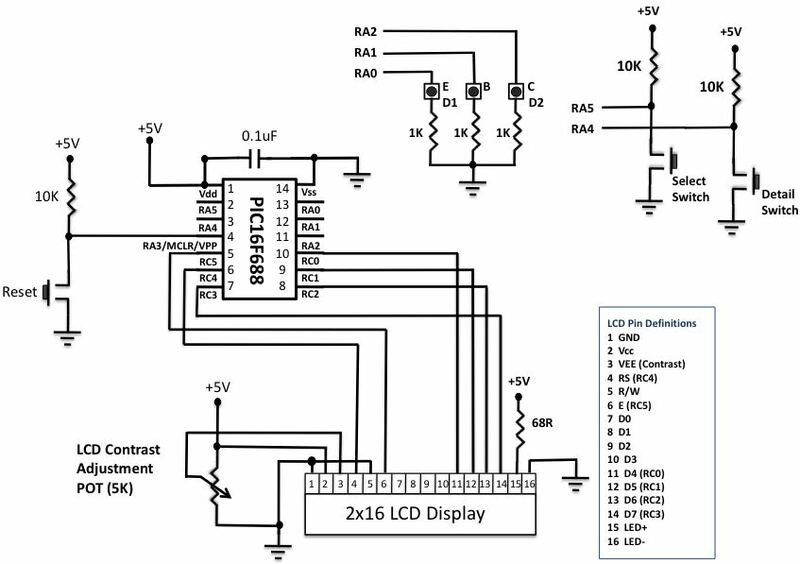 You have to be kidding – using a micro with display module for something that few passive components and LED/multimeter can do? You are right, there are easier ways to achieve the same goal. This project demonstrates that there exist some difficult ones too. 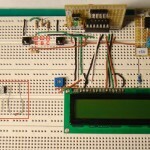 Never mind, the purpose is to demonstrate a technique using microcontroller.